This Weird Feeling of "Not Depressed"
It struck me that this verse was actually true. Of course it was true before, when I had read it with a kind of longing and reassurance that David understood being in the depths. I had read it with desperate hope that one day I would feel this way. Now I realized I actually did feel this way. When we came back from China at the beginning of the year, I though I was mostly better. I just needed to deal with the after-effects of these years of depression and surviving and burnout. We attended a three week intensive debriefing retreat – three weeks because we were that bad off. It was so helpful, but at the end of three weeks I found out that I was still depressed. “High moderate depression," my counselor and her little inventory described it. That was pretty discouraging because I had just had three weeks of daily individual and group counseling and I was still depressed! When I thought I was doing better! I came to realize that now and in the past what I thought of as depression was actually severe depression. If I could function and didn’t want to die, I figured I wasn't really depressed anymore. Apparently "better" looks like something higher than that. This past month, after continued counseling and a new medication, I have remembered what not being depressed feels like. There are times when I feel what I presume is normal baseline – is this what people really feel like? - like I can handle life and I think that good things might actually happen in the future. I feel stable. It’s a weird feeling. I have been able to enjoy my kids, even to enjoy this stage and not wish they would please just grow up more and not need such constant help and attention. 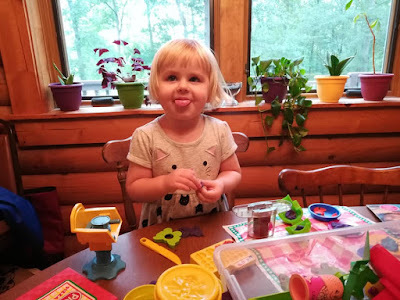 Obviously there are still times when I don’t enjoy them – when Nadia is clinging and screaming, when Juliana is whining and stomping around, when Adalyn has to be prodded every single step of the way to do every single task. But this is the normal counting-down-to-bedtime stuff of parenting. These days, I rarely feel like my head will explode. When no one is screaming, I can actually enjoy this stage with these little people. Of course there are still emotional times, frustrations and disappointments, the discouragement of sickness and poor sleep. But the amazing thing is, I can feel grieved or discouraged and then I can get over it. The next day I may feel pretty good again. I am not dragged down into an endless downward spiral. When my psychiatrist first suggested a mood-stabilizing drug, I was a bit skeptical. “I’m not sure my moods are unstable. Everyone has ups and downs. By the way, what do stable moods look like?” Apparently they look like ups and downs but the ups are above the level of depression and the downs are something you can recover from. Apparently it is not feeling like you are crazy all the time. How interesting. I do feel more stable now. I can see yellow paint or 80’s décor and not feel like everything is really weird and the world is an unsafe place. I can be in a strange or unpleasant situation but when I am out of that situation, I can shake it off without it tainting my whole day or week. One night I was talking with my family about a possible suicide/murder in our town and about a childhood friend with a terrible disease. You know, pleasant bedtime conversation. I felt sad and disturbed but I didn’t even have any terrible dreams that night. And I have had a lot of terrible dreams in these past months. In fact, dreams have come up several time in my counseling because I have had so many disturbing ones. One of my less disturbing but frequently reoccurring dreams, second to stressful travel dreams, are out of control elevators. I’ve had these dreams for years. I get on an elevator and it never goes where I want it to. It shoots up to dizzying heights or drops deep into the ground or veers sideways into different buildings. I can never get where I want to go. A few weeks ago I had another elevator dream. I got in an elevator and realized there were no buttons. All it had was a big lever you had to pull at just the right time to stop on the right floors. In my dream I was able to pull the lever and stop at just the right floor - twice! I was excited by this dream because it was the first time I had ever been able to control the elevator. Even though it wasn’t easy and didn’t function like I expected, I was able to make it work! I think this must be what it is like to not feel like your life is out of control. We don’t know how long the local public schools will continue to accept foreign kids or how long our area will continue to accept foreigners. Who will be the next among our friends to have to leave? Sometimes we know months in advance with time to say goodbye. Sometimes it happens suddenly, even overnight, and our global circle means friends we may never see again. We can influence but not control our health. We can prioritize but not control mental health. We know that all manner of situations might force us to change our country, our homes, our jobs, our friends, our schools, our way of life – all in one fell swoop. But I digress. There are so many circumstances of life we cannot control, maybe more than ever before, but somehow life doesn’t feel like it is spiraling out of control. A sickness feels like a regular event that we will recover from. A change of plans is inconvenient, even stressful, but it is manageable. I can see that it will probably not throw our life into utter chaos and alter the entire course of our lives. I have this weird thought that life may actually work out. I have moments when I am downright optimistic. (No fear though, I don’t really thing lasting optimism is in my nature, whereas my witty sarcasm clearly is.) I have these moments when I realize I feel happy, just effortlessly happy in the midst everyday life. Is this what normal feels like? Is this what it means to be truly okay? I forgot what this feeling was like, and it might take a while to get used to, to believe it is not just a fleeting phase. It will definitely take a while to work through the habits and thought patterns carved out by years of depression and anxiety. I realize there were many times in life when I thought I was all better but depression and anxiety were still having a profound impact on my life. I am trying to look back and sort out what was depression and what was me. I am seeing the ways that God has brought healing through counseling and medication and a lot of time. I am climbing out of that deep, dark pit, and the view is looking pretty good up here at ground level. How Crazy is TOO Crazy? I write a lot about mental illness because 1) I have many years of experience with it, 2) I am very interested in mental health and plan to get a counseling degree one day, and 3) I think stigma is stupid and I want to do my part to dispel it. I know I appear to have very little filter, but I actually do reign myself in a bit. If I write something that makes me seem too unstable, then I back off a bit and write about something a little more normal next time. I want to remind people I am more than my depression and anxiety. When I write about my experiences I do worry that readers will think, “Crap, she’s much crazier than I thought.” I want to reassure people that I am not actually any crazier than I have been for the past 20+ years. Actually I am in a better place now than I have been in quite a while, and definitely more stable than many points in the past. The difference is I didn’t talk about it before. So don’t worry - nothing new here. But I do wonder, how much crazy is too crazy. Many people deal with depression and counseling is not too unusual. Everyone feels anxiety sometimes, even if they don’t have an anxiety disorder, so the rational aspect of that makes sense (maybe not being disturbed by yellow paint). But what about schizophrenia? That’s pretty weird, right? What if someone has a panic attack in the airport? So awkward. What if someone needs shock therapy? Uncomfortable, 1900’s stuff. Can we talk about suicide, or will that freak you out? Nobody judges you for a stay in the hospital, but a mental hospital is a whole different matter. We are allowed to be physically sick (although chronic illness and invisible illnesses are probably made up, right? ), but mental sickness needs to have some boundaries. We are allowed a certain amount of crazy before we turn to hushed tones and sideways glances. So one of my fears in writing about my own mental illness is scaring people off. I don’t want people to talk in hushed tones or wonder if I’m about to go off the edge. Because if I am about to go off the edge, I want to be able to be honest and get help to pull me back. What I deal with is not actually that uncommon, most people are just pretty good at hiding it, like I did for many years. The main take away is that mental illness affects a lot of people. It undoubtedly effects people you know, probably many people. And a lot of people don’t get help, likely for various reasons. The cost of healthcare, for example. While our insurance covers counseling, the ever increasing deductible means I will be paying for it out of pocket, and counseling is not cheap. I feel like it is worth spending the money on, but for many people it is just not possible. Some people don’t even realize they are dealing with mental illness. In high school and even college, I didn’t understand what the problem was, I just knew something had to be wrong with me since I couldn’t seem to handle life like everyone else. I didn’t tell anyone about my suicidal thoughts partly because I didn’t know how to. Even my most recent 4th period of major depression took me a full year to recognize, and I “should” know by now what depression looks like. When I was younger I also didn’t talk about my depression and anxiety because I was afraid of people thinking I was really weird or weak. The stigma may have lessened but it is still very real, and like in most things, adolescents are probably the most susceptible to being misunderstood. I am fortunate now to know a lot of people in the mental health field – and a lot of people with mental illness – who are willing to talk about it. This makes a huge difference in my willingness to be open, and many people don’t have that. If you struggle with mental illness, here are some things I want you to know. You are not alone. Once you open up about it in whatever way you feel comfortable with, you will undoubtedly find other people who are struggling too. Find someone you feel safe with, who will listen without judgment and try to understand you. If you are having a hard time, it is okay to protect yourself from the constant news cycle and overwhelming information. Expect less of yourself for a while, because dealing with the rough periods takes a lot of energy. Get the help you need. This is not selfish – this is important to your health and wellbeing. This is not weak; it is brave. Maybe you would find counseling helpful. Find a counselor you connect with and that actually helps you. Sometimes medication is really useful, because sometimes your brain chemistry needs some help. There is nothing wrong with taking medication! Recognize that you are a spiritual, physical, mental, and emotional being and that all these areas are affected. Addressing the spiritual component is helpful but “thinking the right thoughts or praying enough” does not address the other areas, and puts a lot of guilt on yourself that maybe if you had a strong enough faith you would be joyful or anxiety-free. This does not make any more sense than someone telling you that focusing on truth and praying enough will cure you of cancer or high blood pressure It is just not true. Realize that a lot of people truly don’t understand what you are going through, and if you say, “I am dealing with anxiety,” that doesn’t necessarily mean a lot to them. Talk about the specifics of what you are struggling with: “I feel like my chest is tight all the time and I can’t breathe or think clearly.” Give them some grace as they try to understand. But again, talk to people who are trying to understand. For your own sake, avoid sharing too much with people who are just critical or give unwanted advice. For those of you who are close to someone with mental illness, try to listen and understand instead of giving advice. Recognize there is a difference between “feeling down” and clinical depression, between feeling worried about a problem and anxiety disorder. A counselor tried to explain the difference to us like this: If you are feeling down, maybe you should take some brownies to a neighbor because doing something for someone else is a pick-me-up. If you are clinically depressed, this won’t help. You don’t have energy to make brownies in the first place, and even if you did you don’t want to leave the house to see the neighbor. You can encourage things like exercise (“Why don’t you meet me to walk once a week?”) and self care/getting out of the house (“Let’s have coffee this week.”) but also realize in themselves, these are not solutions to serious problems. In fact, carrying the weight of another person's problems or trying to be their sole support is draining on you and unhealthy for both of you. Encourage your friend to seek help. Finding a counselor or support group can be overwhelming, so if they are open to the idea, help them find some resources and possibilities. When I was really struggling in China, our member care specialist helped me to find resources within China. She called them to find out details, costs, and how to get in contact with them. It was a huge help, because a task like that was completely overwhelming to me. Learn what you can about what your friend or family member is dealing with. Knowledge often takes away some of the fear. Ask them what their experience has been like. Ask questions like, "What does depression feel like for you? What are some things that trigger your anxiety? What things have you found helpful or not helpful in the past? What are some areas of daily life you struggle with most?" Recognize that a person might not know what they need or may have trouble accepting help, so instead of "Let me know if you need anything," you could try, "I’m going to make food for you this week – what day is best? Let’s meet for coffee and a good talk - what about Wednesday?" Ask about specific ideas like watching the kids or helping to find possible counselors in the area. In parting I will share a few words from Jenny Lawson, an author who writes hilarious books about mental illness. If you are mentally ill, are not afraid to snort-cry-laugh, and are not terribly put off by a lot of swearing, check her out. She is amazing. Today I dropped the girls off for their first day of American school. Juliana was nervous because she had never been to the school and didn’t know anyone, but she was fine once she got to class. I told her it was normal to be nervous but reminded her that she was worried at VBS that she wouldn’t have friends. That lasted until the second day when she had a new friend she was very sad to leave at the end of the week and gave my phone number so they could keep in touch. The only problem was it was my China phone number. 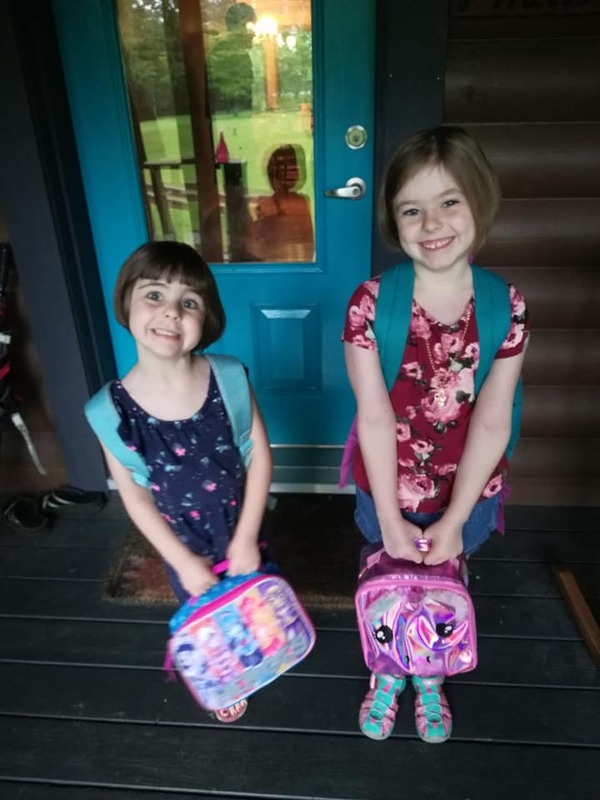 I just discovered this summer that our county has a free pre-K program, so Adalyn is now going to the same school as Juliana. It is a full day but seems pretty laid back – two recesses, nap time, and centers like blocks, imaginative play, art, etc. Adalyn hadn’t thought much about it, or at least hadn’t talked about it, until she saw her classroom at open house the other day. She came home excitedly telling everyone about the play kitchen and how much fun it looked, so I think she’ll really enjoy it. I found it both strange and cool. I am used to being in charge of their education – choosing curriculum and our pace, knowing everything they are learning. It is strange handing them off to someone else and not really knowing what they are learning, besides the undoubtedly convoluted reports. Although I remembered I have sent them to Chinese school, where I really did have no idea what was happening. It is still amazing to me that you can just send your kids off to school for free, and someone else prepares their lessons and decorates their classroom and is entirely responsible for their education. I don’t take that for granted! We also found out that a family of 5 can qualify for free/reduced lunch if they make less than $56,000 a year. Who makes more than that?? How would we ever afford America? Needless to say, we qualify. Juliana was understandably nervous because even though she attended three years of Chinese preschool/kindergarten and went part time to international school, this is her first school experience in America. I tried to teach her some of the ins and outs. Me: Do you remember what your teacher’s name is? Juliana: No, but that’s okay. I can just call her Teacher. Me: Actually people don’t do that in America. Juliana: What? Why? You do in China. Me: I know. In China it is respectful but in America it seems like you forgot the teacher’s name or something. The other night we had an beginning-of-school dinner at McDonald’s, a month after our end-of-school McDonald’s. As we were eating, Juliana tried to describe a boy she was playing with in the play area. Juliana (lightbulb moment): He was PUDGY. That’s right, he was pudgy. Me: Um, Juliana, people in America don’t really like to be called pudgy. Juliana (perplexed): But I thought we weren’t supposed to call people FAT. I thought pudgy was okay. Me: Well, people don’t like to be called fat or pudgy. Juliana (still perplexed): But people say that in China. Me: I know, but it’s one of those things that is different in America. Juliana: So...then...What DO you call people? Me: In America you just don’t talk about people’s weight. Me: Really. Ever. Unless maybe you are a doctor. There are many things that our little third culture kids have to learn! We are learning as well – how to sign the kids up for school and for free lunch. How pick up and drop off works. What kind of things kids do and learn in American schools. BUT, we don’t have to decode 30 Chinese classroom WeChat messages a day. When we wait to pick up the kids, nobody stares at us openly or covertly because we look different from every other person around. People actually do things like line up instead of swarm the gates. I don’t feel like an idiot when communicating with the teachers because my command of English is actually quite good. The girls are not the only kid in the class/school that looks completely different, has a different background, and speaks a different language. They don’t struggle to understand what the teacher is saying or what they are supposed to do. They don’t have to stay silent during lunch… Not that they have disliked Chinese school, but I think they are going to enjoy this time in American school. Nadia thought it was a little weird not having any sisters around, and she was sad she couldn't go to school too. But she quickly recovered and will undoubtedly enjoy the extra attention. She was excited to tell her sisters when they returned about her trip to library story time and the grocery store. So I think we’ll all adjust.